The full-size sedan that turns heads - it's the Toyota Avalon! 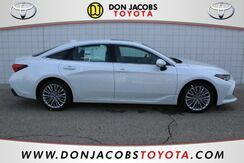 Get the best price on it at Don Jacobs Toyota in Milwaukee, WI. Our Toyota dealership is dedicated to showing you all the features of this car and our entire Toyota lineup so you can make a great choice on a new, used or pre-owned Toyota. You’ll love driving this elegant, full-size car! Take a look at our new Toyota cars for sale like the Toyota C-HR XLE. This and more great new models are waiting for you at our Milwaukee, WI, Toyota dealership. All the technology features, the comfort and reliability you love about Toyota – find it here and pay less with our offers, incentives and specials! Great financing deals at Don Jacobs Toyota!